Next week, the United Nations meets to review progress on five of the 17 Sustainable Development Goals. Access to water, SDG6, is one of the goals in the spotlight. Following a high-level conference in the Tajik capital of Dushanbe, Dr. Soumya Balasubramanya of the International Water Management Institute tells Farming First about the water security challenges facing the Central Asian country, and how women can be key to solving them. Nestled in the heart of Central Asia, the agricultural sector plays a central role in the economic and cultural life of Tajikistan. But after gaining independence from the Soviet Union in 1991, the country’s farming industry has struggled to modernize itself and tackle water stress and irrigation maintenance challenges. Through focusing on the growing role of women, the country can revitalize the sector. Around 70 percent of Tajik citizens live in rural areas, and agriculture accounts for 60 percent of the country’s GDP. A massive 95 percent of farm production takes place on irrigated land, which means that healthy water irrigation systems are essential for keeping the sector running. After independence, Tajikistan’s water management system fell into structural disrepair. Large collective farms were carved into to small private farms (dehkans), making irrigation extremely complicated. Irrigation systems deteriorated, water management collapsed, agricultural output began to decline, and poverty worsened. Men began to leave the country in droves, to search for better paid work elsewhere. An estimated one in eight Tajiks leave to find work and around 90 percent of these economic migrants are male. As the men search for greener pastures, more women are managing dehkan farms, creating a ‘feminization’ of agriculture within the country. Along with help from USAID in 2012, Tajikistan introduced water user associations (WUAs) to allow thousands of dekhan farm managers to take charge of the way water is managed. When the WUAs were first initiated, 98 percent of dehkans were run by men, but this number now lies at around 75 percent, indicating a sea-change in the gender demographics of this role. Abdullaeva Uguloi is one of only 13 women in charge of water user associations in Tajikistan. In order to involve the women now at the head of many dehkan farms, women need access to training on how to participate in WUAs. Because of established gender roles which do not associate women with technical work, this has not been happening widely enough. According to new research from the International Water Management Institute, female-run dehkans are 9 percent less likely to pay fees to WUAs, meaning less money is going towards vital repair and maintenance works on the irrigation canals. They are 11 percent less likely to sign water contracts, meaning district offices will budget less water than is needed for their communities. They are also 3 percent less likely to attend WUA meetings, meaning they have little say over decisions such as the irrigation timetable, for example. Despite the challenges, women like Abdullaeva Uguloi are fiercely in favour of having more women take up roles at WUAs. She views water scarcity as an issue which greatly affects women, and they are well equipped to resolve it. This means it is essential to make access to training more readily available for them. Abdullaeva is one of just 13 women across the country who manages a WUA. Abdullaeva added that women are less likely to waste money, have a strong work ethic, and are less likely to become involved in tensions related to the running of the WUAs. The potential of WUAs to strengthen Tajikistan’s economic growth is immense. Strong irrigation management can enable Tajikistan to boost production of major crops (cotton and wheat), increase diversity in production of fruits and vegetables, and improve domestic access to water to improve health, nutrition, and quality of life. According to our research, the length of training in water management is important for good water governance. Results from studies conducted by IWMI showed that farms whose managers received a longer period of training in water management were almost 8 percent more likely to pay their membership fees, 20 percent more likely to sign a contract with a WUA and more willing to contribute additional time for maintenance and repair of the canals, all of which are essential for ensuring the running of the WUA programmes and that water is kept flowing. As gendered migration trends look set to continue, endowing women with the training they need to successfully participate in water management in Tajikistan will propel all farmers to success. Changing agricultural policy to reflect the growing importance of women will prove vital for raising production rates and streamlining farming systems across the sector. This week, from 1 – 6 September, world leaders, NGOs and businesses will gather in Stockholm to discuss the future of water security at World Water Week. Taking place during the UN’s International year of Water Cooperation the week will focus on ‘Cooperation for a Water Wise World’, which will include discussions on international cooperation, sanitation and community ownership of water. Issues relating to water scarcity have been moving up the development agenda in recent years as more pressure has been placed on this resource than ever before. World Water Week will occur just under a month after World ‘Overshoot Day’, a day that marks the moment when the world has officially consumed more natural resources than the biosphere can replace this year. ‘Overshoot Day’ has been reached two days earlier than last year, demonstrating the increasing pressure on the world’s resources. As the world works to achieve sustainable development, cooperation between sectors is essential to address the unprecedented pressures on natural resources. The agriculture sector uses 70% of the world’s water – more than any other industry. As we look to feed a world of nine billion people by 2050 our demand for food – and water – is an interrelated, global challenge. Therefore there can be no solution for water security without agriculture. Moreover, increased water scarcity is expected to lead to a decline in food production, harming many major crops throughout the world. For example the production of irrigated rice could fall by as much as 27%, rainfed wheat by as much as 25% and rainfed maize by 15%. Last year the overarching theme of World Water Week was ‘Water and Food Security’, which looked at the close connections between the agriculture sector and water use, suggesting that a sustainable solution would only be achieved if both elements were considered. A central discussion point of the week was the water-food-energy nexus and the need for holistic solutions to tackle some of the world’s biggest challenges. Food production uses a vast amount of the world’s water and energy resources but at the same time decreasing water and energy resources are having a dramatic impact on food security. The recognition of agriculture in providing solutions to water security at last year’s event was welcomed by Farming First, as agriculture holds a unique position both as a challenge and a solution to some of the world’s most pressing issues. World Water Week 2013 – What role can agriculture play? 2.6 billion people still lack improved sanitation and just under one billion go to bed hungry every day. These two devastating statistics can be overcome if cooperation between water and agriculture policies can be achieved. Farming First hopes that World Water Week 2013 will build on the promising discussions from last year on the water-food-energy nexus and acknowledge the agriculture sector as a key player in water security solutions. The 2013 World Water Week report, released on 19 August, is a positive start to this year’s event, with agriculture being recognised throughout as vital “to achieve both food security and green growth objectives”. Farming First hopes that uniting all these sectors to achieve water security next month will help to build substantial partnerships between key water and agriculture stakeholders, with sustainable agriculture being seen as a central solution to achieving water security. Water is a precious resource so improving its use is essential. Adopting proven sustainable agricultural practices reduces water use per bushel. Research, innovation, and access to improved technologies, seeds, and improved irrigation techniques are essential to increasing the efficiency of water use. Agriculture needs to be part of watershed management. A unique global platform for promoting water sustainability in arid regions. 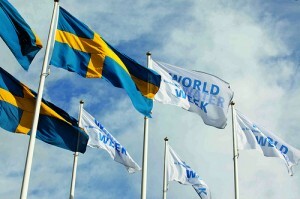 Over two thousand politicians, CEOs, scientists and leaders of international organisations have descended on Stockholm for World Water Week, the annual knowledge-sharing event hosted by the Stockholm International Water Institute. The theme of this year’s conference is “Water and Food Security”. The week opened with a global call to action to reduce food waste as a means to preserve water. At the opening session, global leaders called for substantial increases in public and private sector investment to reduce losses of food in the supply chain, enhance water efficiency in agriculture and curb consumer waste. More than one-fourth of all the water we use worldwide is taken to grow over one billion tons of food that nobody eats. That water, together with the billions of dollars spent to grow, ship, package and purchase the food, is sent down the drain. Reducing the waste of food is the smartest and most direct route to relieve pressure on water and land resources. It’s an opportunity we cannot afford to overlook. Over 100 sessions are scheduled to take place throughout the week, where convening experts will debate and showcase solutions to ensure that the world’s limited water resources can meet the needs of growing economies and support a healthy global population. The numbers show that agriculture is a thirsty activity. But that also means that agriculture holds the key to sustainable water use. Investment in smallholder farmers is critical to achieve food and water security for all people. Last week the Stockholm International Water Institute released a report: “Feeding a thirsty world: Challenges and opportunities for a water and food secure future”. Authored by a dozen experts from SIWI, the Food and Agriculture Organization (FAO) and the International Water Management Institute (IWMI), the report provides new evidence that shows how continuing current trends in food production could lead to increased shortages and intense competition for scarce water resources in many regions across the world. Addressing the challenges related to “water and food security”, through the entire chain from production to beneficial use and waste, calls for focus on a wide range of technical, economic, financial, institutional, governance and political issues, with the “triple bottom line” of economic development, social equity and environmental sustainability guiding us. Get involved with World Water Week and watch the live webcast. Read more about applying the Farming First principles to increase water use efficiency. The management of water resources across boundaries, whether sub-national or international, is one of the most difficult challenges facing water managers today. 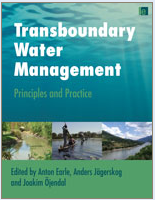 A new book, published by Earthscan, addresses the challenges of managing transboundary waters around the world, providing a fully comprehensive review of the various issues involved with the aim to help policy makers in their decisions. Whilst water is bound by no political, economic or social margins, it is a political, economic and social issue, and an inequitable distribution of water resources around the world is a major cause of competition and conflict between countries. Whilst the argument of ‘water wars’ has been gaining traction recently, rather the authors of ‘Transboundary Water Management’ advocate for a cooperative environment in managing water resources, to unlock their contribution to regional sustainable development. The book examines the current challenges faced by governments and organisations involved in water management initiatives in international river basins. These include international laws, governance issues and existing conflicts. The essays also consider the future situation in light of socioeconomic and environmental change. Offering valuable insight to politicians and government negotiators concerned with issues of water security, the book identifies business models for transboundary river basin institutions and offers recommendations towards effectuating a framework for peaceful and sustainable transboundary water management.